The following letter outlines concerns and opposition to a May 7, 2015 announcement by the Yuba Salmon Partnership Initiative (YSPI), which aims to create a first of its kind trap and haul program in California. As outlined in the letter, we believe that the existing and proposed trap and haul projects around dams runs contrary to sound, wild fisheries recovery science, the intentions and requirements of the Endangered Species Act and many state fisheries management plans. Diverting limited resources and attention to such projects is a serious threat to future investment in effective river restoration efforts like full dam removal and achieving self-sustaining fisheries recovery nationwide. The DamNation filmmakers have delivered the petition with 70,000 signatures for the Obama administration to crack down on deadbeat dams. As we look back on the incredible impact the film has had so far, we're also asking ourselves, what's next? Keep sharing and supporting the petition, but also let your local elected officials know that you want change. Ask Senators Cantwell and Murray to help remove four deadbeat dams on the lower Snake River. More than 70,000 people from all over the world signed the petition asking President Obama to remove the dams. But the feds want to see support from the leadership of Washington state. A phone call from you to Senators Cantwell (206-220-6400) and Murray (206-553-5545) is the most powerful way to get that support. Starting February 20th, 2015, DamNation will be having 50+ screenings across Germany, Austria and Switzerland, as a part of the Banff Mountain Film Festival World Tour. Kicking off in Munich on the 20th and hitting Berlin, Zurich, Salzburg and many more, DamNation wraps up at the end of April. Visit their website to see an overview of the tour or a map showing of all the screenings. Starting today, December 4th, DamNation is available to watch anywhere in the world from Vimeo On Demand. Just select your language from the CC dropdown menu in the player window. Below is a complete list of platforms, territories and languages we're available in. More Good News From DAMNATION! DAMNATION RECEIVES BEST DOCUMENTARY FEATURE AWARD AT THE 2014 DESTINY CITY FILM FESTIVAL! Last year I scoffed at the biased mess that was “Gasland.” I wish “DamNation” had been out so I could have pointed to it to say this is how you present an issue you have strong opinions about without having the audience feel like they’re being conned...It’s a wonderful film filled with amazing sequences of inspiring protest efforts, beautiful scenery, and a heart-warming if sad jackpot of old movie footage of a trip down the Colorado River that will make you want to cry for the destruction dams have wrought. It’s great and a role model for how to make a solid environmental documentary that addresses a controversial issue in a level headed and dignified way. More movies like it are needed. I really can’t say enough good things about this movie. It’s both nostalgic and contemporary. It’s hip and cool enough to feel like it’s for a younger demographic, yet dignified and even reverential at times to play to the older crowd. It has great visuals, but not at the expense of substance. It also captures the broad sweep of the past century to feel like the voice of the very best of the American environmental movement. People squawk at me often, “Well, what is your idea of a good documentary?” This film is my answer, plain and simple. It’s a role model for all aspiring environmental filmmakers. It doesn’t have perfect narrative structure, it has a few minor shortcomings (would have liked a little more explicit addressing of the bottom line on the “jobs vs. environment” divide when it comes to dam removal), but a movie can only do so much in addressing an issue—it’s not the same as a book. The movie does its job incredibly well. AND … it’s fun! Click here to read the full review from their site. The film will be available through iTunes rental for $3.99/$4.99 (SD/HD) or purchase for $7.99/$9.99 (SD/HD). Viewers can also watch it on demand via Comcast, Time Warner, Cox, Bright House, Verizon, Charter, Suddenlink, AT&T, Google Play, VUDU, Amazon, PlayStation, and Xbox. On June 5, Patagonia presented free screenings of DamNation in 23 cities to audiences totaling more than 6,400 nationwide. Twenty-six thousand people have already signed Patagonia’s online petition urging President Obama to authorize studies on removing four problematic lower dams on the Snake River – and thousands more have signed petition postcards. DamNation has been hailed by The Los Angeles Times, The Village Voice, National Geographic and Time Magazine. Patagonia founder Yvon Chouinard published an op-ed in The New York Times arguing for the removal of low value, high cost dams. DamNation is a film odyssey across America that explores the sea change in our national attitude from pride in big dams as engineering wonders to the growing awareness that our own future is bound to the life and health of our rivers. Dam removal has moved beyond the fictional Monkey Wrench Gang to go mainstream. Where obsolete dams come down, rivers bound back to life, giving salmon and other wild fish the right of return to primeval spawning grounds, after decades without access. DamNation’s majestic cinematography and unexpected discoveries move through rivers and landscapes altered by dams, but also through a metamorphosis in values, from conquest of the natural world to knowing ourselves as part of nature. DamNation is produced by Patagonia in association with a Stoecker Ecological & Felt Soul Media Production and is set for theatrical release in select cities beginning in April. DamNation (87 min, U.S., 2014) Directed by Ben Knight and Travis Rummel. Produced by Matt Stoecker and Travis Rummel. Editor: Ben Knight. Director of Photography: Ben Knight. Director of Underwater Photography: Matt Stoecker. Associate Producer: Beda Calhoun. Executive Producer: Yvon Chouinard. Featuring: David James Duncan, David Montgomery, Elmer Crow, Rebecca Miles Jim Waddell, Floyd Dominy, Katie Lee, Lee Spencer and Mikal Jakubal. We have spent the last 3 months crisscrossing the country and DamNation has screened over 70 times at film festivals, theaters, town parks, in big cities and small towns. We have over 25,000 signatures for our Crack Down on Deadbeat Dams petition to President Obama. We have won multiple awards at festivals for 'People's Choice' and 'Best Feature Film.' Needless to say, things have been very busy and very exciting. We are excited to launch our film online this week! On Thursday, June 5th, we screen in 23 Patagonia retail stores nationwide and on Friday, June 6th, we release the film (in the US) for digital viewing through our website, www.damnationfilm.com. The film will be $5.99 to rent and $9.99 to buy. If you have not seen the film yet, your wait is over! For all of you, please share the film with your family and friends, with your help, we can change the game for rivers in the US (and beyond!). The Audience Award is chosen via ballot by attendees at the Closing Picnic & Awards Ceremony. The environmental costs of massive dams that support hydropower generation outweigh their benefits. We do not agree that hydroelectric power generation is a “low-emission” and “renewable” source of energy as more studies are showing that dams and their reservoirs are significant emitters of greenhouse gases worldwide, while also exacerbating the negative impacts of climate change. Arguing that hydropower is “clean” completely misses the immense environmental costs of stopping up a free-flowing river, which blocks wildlife migration for keystone species like salmon, degrades water quality and stops critical sediment flows to our disappearing coastlines. Hydropower is made possible by dams, and dams create devastating impacts on the surrounding ecosystem, which relies on fish for food and to spread nutrients. These impacts run the length of the river to the ocean, where sediments are needed to protect against rising sea levels and storm surges caused by climate change. Patagonia, by supporting DamNation, is focusing attention on a growing national movement to remove dams where the costs (including environmental, safety and socio-cultural) outweigh the replaceable benefits (including hydropower, flood control, irrigation or recreation) – or where the dam no longer serves any useful purpose. Many dams also pose a serious safety hazard. Currently, 26,000 dams are officially labeled either “high hazard” or “significant hazard” by the federal government. Removing the many dams that have low value but high costs, like the four problematic lower dams on the Snake River, will help restore water quality and flows for fish and wildlife, reinstate the natural sediment and nutrient flow, eliminate safety risks, create opportunities for whitewater recreation, save taxpayer money and bring our rivers back to life. But hasn’t the hydropower industry made significant strides to mitigate its footprint? Isn’t the Pacific Northwest now seeing record fish returns? Unfortunately, that’s not true. Contrary to repeated statements from federal agencies, and hydropower advocates, most wild Snake River salmon and steelhead returns remain at about the same levels as when they were first listed under the Endangered Species Act (ESA) in the early 1990’s and at only a fraction of their pre-dam populations. The last couple of years have shown some minor increases in overall fish numbers – especially compared to the dismal returns we’ve seen lately – but around 80 percent of these returns are hatchery fish, not wild ones. Flooding watersheds with hatchery fish costs the taxpayer hundreds of millions of dollars annually on the Columbia River alone – it does not constitute “significant strides to mitigate” dams or even recovery goals for wild fish. The Department of Energy has identified potential areas where there is an untapped potential for hydropower generation. Shouldn’t we be expanding it? The most viable sites have already been developed. Most of those few remaining sites have been targets of repeated permits or license applications met with multiple failures due to poor economics, impractical technology, and the high cost of environmental damage. The bottom line is that our country has no rivers left for dam building. The Department of Energy report didn’t assess the feasibility for building dams, just the potential for electrical generation present on a stretch of river based on computer modeling. Rather than plugging rivers with multiple hydropower dams, or modifying current dams, a cheaper and less environmentally harmful solution is to transition away from dams and towards existing, lower impact, energy efficiency and production technologies. Many dams that have been removed no longer had any beneficial use whatsoever. But 81 percent of Americans believe that the existing hydropower fleet should be maintained, and 75 percent support expanding hydropower. Don’t communities around the country rely on dams for drinking water, irrigation, flood control, recreation and, of course, affordable, low-emission hydropower? The hydropower industry has worked hard to draw attention to the benefits of hydropower, but they of course neglect the major costs of dams. We’ve glorified dams for decades, but our pride in building these engineering marvels has often blinded us to the environmental damage they cause. We made DamNation to educate Americans about the downside of this mislabeled “green” energy. Rather than plugging rivers with multiple hydropower dams, a cheaper and less environmentally harmful solution is to use existing energy efficiency technologies and lower impact production sources. Flood control can often be accomplished more effectively and for less money by restoring floodplains, maintaining riparian buffers, and enabling high flow capture into off-stream basins. Updating antiquated irrigation systems and replacing inappropriate crops dramatically reduces the need for dams and reservoirs in the arid West. Removing the many dams that have low value but high costs, like the four problematic lower dams on the Snake River, will restore water quality and flows for fish and wildlife, reinstate the natural sediment and nutrient flow, eliminate safety risks, create opportunities for whitewater recreation, save taxpayer money and bring our rivers back to life. Does Patagonia want to take out every dam? We believe all man-made dams create a negative impact on river ecosystems, but our efforts are focused on removing the many dams with low value and high environmental costs. Does Patagonia use hydropower to make our products? Yes, we do use hydropower – it’s an inseparable part of our shared electrical gird. But at every turn we are focused on reducing our energy need through efficiency measures, and gaining a higher proportion of power from truly renewable sources like solar and wind, where environmental impacts of generation do not outweigh the benefits. There are good movies, there are bad movies, and then there are movies that matter. DamNation is a movie that matters. An eco-activist documentary with a refreshingly aggressive and law-breaking bend, this new film — made possible thanks in large part to the folks from Patagonia — introduces viewers to one of the most overlooked evildoers in the modern world’s assault on Mother Nature: dams. There’s no doubt that dams have served many important roles over the years, from preventing floods and providing power to storing drinking water and making urban growth possible in remote places. But this “progress” has also come at a very steep price. With a blend of history, face-melting nature cinematography, and a dash of Edward Abbey–style criminal mischief, DamNation lays bare this truth in a way that is educational, entertaining, and, perhaps most importantly, inspirational. WATER WORLD: A barge-mounted excavator hammers away at Glines Canyon Dam in a scene from DamNation. It is impossible to separate the story of dams from the story of America in the 20th century. Building river-arresting structures, be they public or private projects, was a critical part of our nation’s rebound from the Great Depression, as well as our domestic World War II–motivated manufacturing efforts and, in the years after, our need to meet ever-expanding energy needs. In fact, some 75,000 dams at least three feet tall exist in the U.S.today, more than 30,000 of which were built between 1950 and 1970. And, while these structures were certainly erected with the greater good in mind, they all share one inconvenient truth: They drastically change the way a river behaves. When you consider the fact that rivers are the proverbial lifeblood of our planet and that various critters call it home, this defining characteristic becomes a potentially insidious and deadly bottom line for fisheries, watersheds, ecosystems, and native ways of life. “A damn is to a river what a coal-fired power plant is to air quality,” explains Matt Stoecker, a restoration biologist based here on the South Coast who, along with Patagonia’s patriarch Yvonne Chouinard, produced the film. A graduate of UCSB, Stoecker, who has been in the trenches of creek and steelhead-trout habitat restoration here in Santa Barbara County for the past decade and a half, came up with the idea for DamNation while attending an environmental film festival in Nevada City with Chouinard back in 2011. Both blissfully addicted fly-fishing nuts with track records of big-picture conservation/restoration efforts, the duo recognized the powerful storytelling opportunity that was setting up that year, thanks to the planned removal that year of two very large dams in the Pacific Northwest: the Glines Canyon Dam of the Elwha River and the Condit Damn on the White Salmon River. If they acted fast, not only could they record these historic restoration-motivated destruction efforts, but they could also document the radically rapid rebound that occurs in nature when a long-stifled river is set free. DamNation has its Central Coast premiere on Wednesday, May 21, at the Lobero Theatre (33 E. Canon Perdido St.) at 7 p.m. For tickets and info, call (805) 966-4946 or visit damnationfilm.com. May 1, 2014, 5:00 a.m.
Patagonia is famous for its high-end outdoor gear, selling its 3-in-1 River Salt Jacket for $549 and a Special Edition Diamond Quilt Snap-T Pullover for $199. In the coming weeks, the luxe retailer will begin stocking a very different item on its shelves: DVDs of "DamNation," Patagonia's self-financed and award-winning environmental documentary. Long admired as one of the most socially accountable companies in America, Patagonia in recent years has become more of an outspoken advocate for environmental and corporate responsibility, letting shoppers openly inspect its supply and manufacturing chain and even encouraging potential customers to stop buying its products and recycle, repair and reuse the clothes they already possess. "DamNation," the first film the company has produced, takes Patagonia's activism to a higher level, and its release will be linked to a petition urging the federal government to tear down what Patagonia calls "deadbeat dams." The movie opens in limited release theatrically May 9 in New York and Portland, Ore., debuting in Los Angeles on May 16. "DamNation" will be screened for free in and for sale at most of Patagonia's 30 retail outlets on June 5, where the DVD will be listed at $24.99 (or $29.99 for a Blu-ray version). A day later, "DamNation" will become available on the streaming site Vimeo for $9.99. Patagonia is supporting the documentary's release with an extensive social media campaign that hopes to take advantage of the company's fervent (if not well-heeled) fans, hosting scores of word-of-mouth screenings for organizations such as the Arkansas Canoe Club, Los Padres ForestWatch and Hells Canyon Preservation Council. "We're not going to be getting any money back on this," said Patagonia's 75-year-old founder, Yvon Chouinard, whose privately held company bankrolled the film's approximate $500,000 budget and more expensive marketing push. "It's just propaganda." "DamNation," which suggests that the more than 80,000 American dams do far more ecological harm than good, is hardly a conservationist diatribe. Directed by Ben Knight and Travis Rummel, the thoroughly researched documentary has won top awards at the South by Southwest Film Conference and Festival and the Environmental Film Festival in Washington, D.C. Early reviews have been enthusiastic. Made over the course of three years, "DamNation" argues contrary to popular belief that hydroelectric power isn't environmentally clean or efficient, that reservoirs formed by dams release vast amounts of harmful methane (owing to decomposing organic material underwater) and that costly fish ladders and hatcheries scarcely mitigate the damage dams cause to spawning wild salmon. Dams ostensibly built to boost recreational opportunities, furthermore, don't necessarily permit the same, as the filmmakers find out when they kayak up to one dam's navigable locks and are assumed to be domestic terrorists. The movie's on-screen partisans, who include former Secretary of the Interior Bruce Babbitt, recommend that the most responsible action is to tear down several large dams and let nature and the subsequently unstopped rivers follow their natural courses. "DamNation" chronicles how quickly Chinook salmon return after the sizable Elwha Dam in Washington is demolished. Those who want to preserve dams say they play a critical role in flood control, maintain the water supply and benefit shipping and recreation. Supporters furthermore argue that dams not only generate necessary and relatively clean energy but also provide work for people who would become unemployed if the dams were removed. Chouinard said he became focused on the downside of dams when Patagonia tried to reverse the ecological demise of the Ventura River, not far from the company's Southern California headquarters. Chouinard in the late 1990s used Patagonia's name and money in newspaper ads to advocate for the removal of the Edwards Dam on Maine's Kennebec River; it was torn down in 1999, and the native ecosystem gradually has been restored. "That's the reason I'm in business," said Chouinard, an avid fly fisherman who recently returned from a fishing trip to British Columbia. "I couldn't care less about making more money or making more clothes. I want to use business to inspire solutions to the environmental crisis." He said he was inspired to make the movie out of frustration with the political process. "You can write letters to your elected officials all day long but they don't even read them," Chouinard said. At the 2011 Wild & Scenic Film Festival in Nevada City, Calif., Chouinard started talking with Matt Stoecker, an environmental activist committed to freeing rivers. "We were talking about the need to show the destruction caused by dams and the amazing things that happen when you remove a dam — including seeing a salmon jump up a river where a dam used to be," Stoecker said. Just like coal-fired power plants, Stoecker said, dams were an idea eclipsed by progress. "It was time to phase them out." Chouinard and Stoecker's timing was propitious, as three large dams were about to be razed, which had the potential of turning an inherently uncinematic topic — large cement structures that simply sit there — into a visual story. But Chouinard and Stoecker, who served as one of the film's producers and directed its underwater photography, struggled to find a willing documentarian. Knight, who with Rummel had made smaller films about fishing, had two immediate concerns: He saw no way to make the issue compelling, and he worried about becoming a Patagonia shill. "Our first instinct was no, and we told them so," Knight said. "It was just too daunting, and it just seemed too difficult to humanize a story about dams. And it's not every day that a clothing company comes out to say it wants to make a documentary." 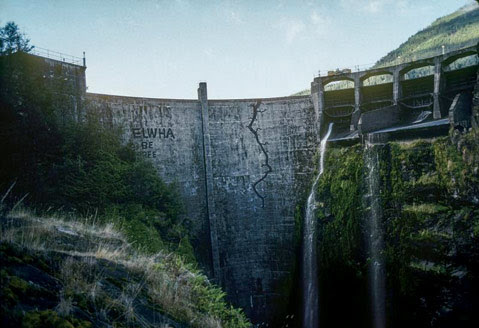 As they kept considering the topic, though, Knight and Rummel were drawn to the idea of following a dam's destruction, and using that event as the film's organizing principle. "We thought, at least there's a beginning and an end," said Knight, who narrates "DamNation." They were promised editorial independence from Chouinard but then had to figure out a way to film the dams. "We honestly had to do a lot of sneaking around," Knight said. "Dams are really unwelcoming places." He said that even without Patagonia looking over his shoulder, he was mortified when he and Rummel showed up in their kayaks wearing matching hoodies made by the company — "We bought them," Knight said, "as they didn't send us free clothing once" — which made it look like they were promoting the clothing. "But it's not a branded movie by any stretch," Knight said. Chouinard said "DamNation" ultimately builds on what almost every child was taught by his or her parent. "If you make a mess, you clean it up. You don't just walk away from it," he said. The time has come, he said, to tear down, rather than build, more dams. "I hope this film leads to a revolution," Chouinard said. "A revolution about how we think about our water, and how we think about our rivers." It’s been a month since DamNation made its world premiere at SXSW in Austin, Texas. First and foremost, we would like to thank all of the people who’ve come out to see our film. Your support is greatly appreciated. Moving forward, we have a bunch of news and some important action alerts to share, so let's get to it. When, as a young man, DamNation co-producer Matt Stoecker witnessed migrating steelhead jump at, and bounce off, Stanford University’s Searsville Dam on San Francisquito Creek, he recognized the destructive power a single dam can have on an entire watershed and beyond. Matt is now a fish biologist, who has since spearheaded the removal of more than a dozen such barriers to migration and is actively involved in efforts to dismantle several others. When he and Patagonia founder/owner Yvon Chouinard, a long-time “dam buster” who for years has supported groups working to tear down dams, decided to capture such efforts and their healing effects on film, and share them with the world, they teamed up with Felt Soul Media’s Ben Knight and Travis Rummel, and DamNation was born. Today, American Rivers announced their annual list of America's 10 Most Endangered Rivers and we’re happy to see San Francisquito Creek and Searsville Dam coming in at number five. San Francisquito Creek is the only nominee with a problem dam to be recognized by American Rivers this year. Making the list of most endangered rivers certainly isn’t a cause for celebration, but it’s a big deal in the river community and should bring national and local attention to the efforts that are underway to remove Searsville Dam. Unfortunately, it remains unclear whether Stanford University will remove their unneeded Searsville Dam and upgrade to a more reliable, sustainable and safer water system. The university is studying alternatives, including dam removal, and has promised to make a decision by the end of the year. Numerous examples throughout the country have proven that when a dam is removed, migratory fish quickly reestablish themselves above the barrier, often within weeks. Invasive species populations from the reservoirs are significantly reduced and water quality and habitat improve. Communities are made safer and the liability risk for dam owners is eliminated. As a business member of the Beyond Searsvile Dam coalition, who is leading the charge, we urge Stanford to show leadership as environmental stewards and choose an alternative that will remove Searsville Dam, restoring this ecologically significant creek while protecting local residents from flooding and safety concerns. A redesigned version of DamNationFilm.com was launched recently, and with it comes a full list of upcoming screenings. Newport, Rhode Island; Missoula, Montana; Portland, Oregon and Carbondale, Colorado will round out our film festival screenings in April. Looking ahead, the film will have its theatrical release on May 9 in New York at the IFC Center, followed by a release on May 16 in Los Angeles at the Laemmle NoHo 7. The theatrical release is coupled with a nine-city tour of one-night film premieres in select markets in April and May, and a nationwide screening event at all U.S. Patagonia retail stores on June 5. Please check the Upcoming Screenings page for details and tickets, or apply to Host a Screening in your home town. DamNation is proud to be partnering with Vimeo On Demand to bring our film to your computer, laptop, tablet and smartphone. Preorders are being accepted now for DamNation’s digital release on June 6, 2014. And if you like DamNation, you’ll want to check out the Patagonia Collection at Vimeo On Demand. Curated by Patagonia and Vimeo, this collection of online films showcases Earth’s elegance, strength and fragility. Visit Vimeo on Demand to see the Patagonia Collection and preorder your digital copy of DamNation. We’re thrilled to announce that DamNation won the SXSW Film 2014 Audience Award in the Documentary Spotlight category, and the Documentary Award for Environmental Advocacy (and a $10,000 cash prize), at the 2014 Environmental Film Festival in Washington, D.C. The filmmakers express their gratitude to festivalgoers for the positive reception, celebrating the news as a sign that the urgent issue of dam removal is resonating and will continue to build momentum as the film tours across the country. March 15, 2014, New York, NY – DamNation has won the SXSW Film 2014 Audience Award in the Documentary Spotlight category, the festival announced today, following the film’s world premiere at SXSW on March 10. The filmmakers expressed their gratitude to festivalgoers for the positive reception, celebrating the news as a sign that the urgent issue of dam removal is resonating and will continue to build momentum as the film tours across the country. DamNation is a film odyssey across America that explores the sea change in our national attitude from pride in big dams as engineering wonders to the growing awareness that our own future is bound to the life and health of our rivers. The film is produced by Patagonia in association with Stoecker Ecological & Felt Soul Media. The film will open in theatrical release on May 9 in New York at the IFC Center, followed by a release on May 16 in Los Angeles at the Laemmle NoHo 7. The theatrical release is coupled with a nine-city tour of one-night film premieres in select markets in April and May, and a nationwide screening event at all U.S. Patagonia retail stores on June 5. DamNation will also play for one week in Portland, Oregon on April 17 upon its premiere as the opening night film of the Portland EcoFilm Festival.Additionally, the film will receive the Environmental Advocacy Award at the DC Environmental Film Festival on March 30. For additional play dates, visit: damnationfilm.com. DamNation, 87 min, U.S., 2014. Directed by Ben Knight and Travis Rummel. Produced by Matt Stoecker and Travis Rummel. Editor: Ben Knight. Director of Photography: Ben Knight. Director of Underwater Photography: Matt Stoecker. Associate Producer: Beda Calhoun. Executive Producer: Yvon Chouinard. Featuring: David James Duncan, David Montgomery, Elmer Crow, Rebecca Miles Jim Waddell, Floyd Dominy, Katie Lee, Lee Spencer and Mikal Jakubal. 10, 9, 8… the DamNation premiere countdown has begun! After three years of planning, researching, shooting and editing, the film is finally complete. And we’re thrilled to announce the world premiere ofDamNation will be at South by Southwest (SXSW) in Austin, Texas on Monday, March 10, 2014. It has been a huge team effort. To all of you who have been helping and following our progress, thank you for your patience, support and energy throughout the process. We are humbled by the continued interest and excitement around DamNation. Making this film has been one of the most challenging and rewarding experiences of our lives. To premiere DamNation at SXSW is an absolute dream come true. Our goal, since day one, has been to reach a broad audience with the film and we are confident that the size, location and diversity of events at SXSW will launch DamNationon an incredible journey. Come to the premiere! We would love to see you there. The premiere screening on March 10 will be followed by a Q&A with Executive Producer Yvon Chouinard, Co-Directors Ben Knight and Travis Rummel, and Producer Matt Stoecker. There will be additional screenings on March 11, 13 and 14 in Austin. Details are on the SXSW Film page. Follow us on Facebook or Twitter for updates. Premiering the film is just the first step. DamNation will be screening at film festivals nationally and internationally throughout 2014. Sign on to our e-mail list to receive updates. Beyond film festivals, DamNation is set for U.S. theatrical release in New York and select markets in April/May, coupled with a nine-city U.S. tour of regional film premieres, and we are partnering with non-profit groups across the country to host screenings of the film in a town near you. The U.S. tour will be coming to Seattle, Portland (OR), San Francisco, Santa Barbara, Santa Monica, Denver, Washington DC, New York City and Portland (ME). Please join us at one of the tour stops – the whole film crew and some of the starring characters will be there, along with local non-profit groups who are working on river restoration projects in your area. If you would like the film to come to your town, ask your local river restoration or recreation group, club, church or school to e-mail us. We are making it easy to show DamNation locally and will provide critical tools to help make your event a success. Non-profit and educational screenings begin May 1, 2014; our goal is to have over 500 screenings in 2014. The film will be available for pre-buy on the DamNation website through Vimeo On Demand in March, and will be released on Vimeo, along with iTunes and a number of other digital platforms in June. As the distribution of DamNation evolves we will keep you posted. Stay tuned to DamNationFilm.com, Facebook and Twitter for the latest news, action alerts and updates. A little over a year ago, a 125-foot-tall dam stood in Washington’s White Salmon River, a concrete plug with a serene reservoir at its back and a trickle of river spilling out downstream. But it’s hard to tell that today. The Condit Hydroelectric Dam, which was built in the early 1900s to harness the energy of the White Salmon for local industry, was blasted into the history books in October 2011 with 700 pounds of carefully placed dynamite. The explosion, part of a phased project orchestrated by dam operator Pacificorp as an alternative to building costly fish passages, released the White Salmon River in a torrent of muddy water, debris and sediment, draining Northwestern Lake in less than two hours and freeing the river for the first time in almost a century. 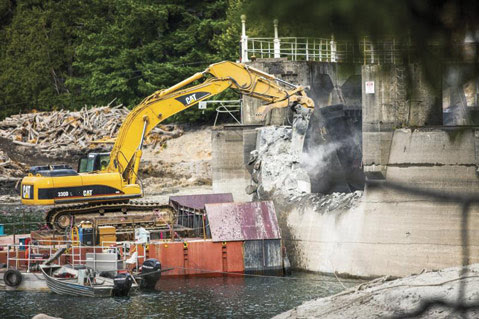 Since that time, demolition crews have completed the removal of some 35,000 cubic yards of concrete, as well as logjams and other debris in the river. And when public-access restrictions were lifted in early November, a group of boaters, river activists, biologists, rafting guides and kayakers converged for a historic float. About 30 people — including individuals who had followed the dam-removal project since day one — piled into two rafts and 13 kayaks to float a section of river that had been reborn. The boaters paddled about five miles of class II and III rapids that wound through what used to be the reservoir and dam site. Though it came together as kind of a spontaneous outing, what commenced was a jubilant and sincere celebration of a river’s revival. The river was running clear — a huge contrast to the sediment-laden waters of a year ago — and on this characteristically drizzly fall day, it carried the boaters through deep canyons and past basalt outcroppings. Salmon passed the boats on their way up river; herons and ducks were spotted near the banks. And compared to a year ago, when the water was chocolate-milk muddy and the landscape raw-looking from the release, signs of revitalization were everywhere. The Condit Hydroelectric Project was located a little more than three miles upstream from the confluence of the White Salmon and Columbia rivers. The section of the river above the reservoir, which is home to fantastic sections of whitewater, has long been popular with boaters. But it had an anticlimactic ending, Kober said. But freeing up a recreational use was only one reason advocates pushed for the dam to come down. They were also driven by a desire to see fish habitats and river ecology restored. “It’s not just the recreational experience, it’s that whole experience of connecting with that river and everything that makes a healthy ecosystem,” O’Keefe said. The group paddled through the former reservoir site, looking high above them to see the bathtub ring that once was a lake’s edge. They passed pillow basalts and waterfalls spilling into the river, before they came to where the dam once stood. “You can hardly tell where the dam was, they did such a good job of cleaning it up,” O’Keefe said. Passing the dam site, they pulled off onto a gravel bank to celebrate. Ben Knight, a filmmaker with Felt Soul Media who was there to document the event for Patagonia’s documentary project, DamNation, said people these days have become almost desensitized to seeing wild places developed or manipulated. After the champagne toast, the group continued downstream, where they were able to run the new version of Steelhead Falls. The dam had previously diverted water around it, but now the class IV rapid was bouncy, dynamic and powerful – just what you would expect from a free-flowing river. Katie Klingsporn is a writer and editor of the Telluride Daily Planet in southwestern Colorado. Look for more of her posts highlighting issues featured in DamNation, a documentary film being produced by Patagonia and Stoecker Ecological in conjunction with the Colorado-based filmmaking team Felt Soul Media. The Susitna is a huge glacial river that drains the indomitable Alaska Range. Denali looms on the horizon. One of America’s last great, wild, undammed rivers, it is home to large numbers of king, sockeye, pink, coho and chum salmon, which push through its heavy currents to spawn in its clear-water tributaries. The “Su” sees the fourth largest king salmon run in Alaska, producing hundreds of thousands of them each year. The state of Alaska wants to build a 735-foot-high dam on the Susitna to generate electricity. It would be the nation’s second tallest. It’s not the first time the Su has been looked to as a potential source of hydropower. Studies done in the 1950s and ‘80s both explored the feasibility of damming the river. Both agreed that it didn’t make financial sense. Today is no exception. There are no private investors currently interested in partnering with the state to build the dam. This says a lot about the economics of the project, which would cost an estimated $5.19 billion dollars – more than $7,000 per Alaskan and more than the state’s annual budget. The dam would have an estimated capacity of 300 megawatts of electricity (the Grand Coulee Dam can generate 7,000‬). The dam would neither bring down the cost of customer’s electricity, nor help with Alaska’s critical heating needs. Its environmental impacts would be far worse than those of using natural gas, which exists in abundance and is currently used to power turbines and heat homes. Tidal, wind and geothermal power offer possible future substitutes. Just above the proposed Susitna-Watana dam site, the clear, fast moving Deadman creek meets the main stem of the Susitna River. Wanting to float the 42 miles of river that might one day be destroyed by the dam’s reservoir, we traveled to Alaska to visit the dam site and document what would be submerged and buried under glacial sediment. The Susitna flows through Alaska-sized country—as cliché as it sounds. Nothing is small. The lower river is accessible by jet boat, and the upper river is crossed just once by the Denali Highway. It is the remote in-between zone where the dam would be built. This was the target of our trip. We floated five days from the McLaren River confluence to the mouth of Devil’s Canyon, where the normally broad river squeezes through a bedrock gorge to produce some of the largest and most challenging whitewater in North America. Covering more than a hundred river miles by boat, we saw groups of caribou, sometimes hundreds of them, around almost every bend. There were signs of wolves and bears along the banks, but not a single person; that is outside of the daily storm of helicopters hovering overhead that had been employed to study the proposed dam. Upstream from Devil’s Canyon and the proposed dam site, we explored crystal-clear tributaries with world-class grayling fisheries, 200-foot waterfalls and river-side cliffs with falcons. We found hundreds more caribou along the extensive floodplain and thickly forested riparian zone. One huge gravel bar within the dam site’s proposed reservoir appeared to be a caribou proving ground. Half a dozen huge males jousted, their massive antlers colliding, while a hundred females circled and watched the display. At one of our campsites near the mouth of Kosina Creek, we sipped whiskey while watching group after group of caribou come down the opposite river bank, swim the frigid 1/2 mile-wide-river and land on both sides of us under a fading pink and purple sky. We’d read studies and heard reports of tenacious chinook salmon spawning in this beautiful tributary after powering through Devil’s Canyon – undoubtedly one of the hardest salmon migrations in North America. Trying to tame the mighty Susitna seems foolish, particularly since the river is entombed in ice much of the year. That any “scientist” being paid to study the proposed dam would call this place a “biological desert,” as we’d heard, or any government proposing to destroy it in the name of “green energy,” seems too ridiculous to fathom. But this is what’s said and what’s planned. The state of Alaska has authorized expenditures of $165 million to push the project through the Federal Energy Regulatory Commission’s expedited permitting process. As farcical as it might sound, the project is very real. “It’s like finding out that your best friend has been diagnosed with terminal cancer,” said Mike Wood, who lives on the bank of the river with his wife. Co-director Travis Rummel in the field during the filming of DamNation. Katie Klingsporn is a writer and editor of the Telluride Daily Planet in southwestern Colorado. Look for more of her posts highlighting issues featured in “DamNation” a documentary being produced by Patagonia and Stoecker Ecological in conjunction with the Colorado-based filmmaking team Felt Soul Media. Folk-singer, desert goddess, rabble-rouser and all-out spitfire Katie Lee has been raging against Glen Canyon Dam and its reservoir, Lake Powell, for more than 50 years. Lee, who is featured in “DamNation,” a documentary film produced by Patagonia and Stoecker Ecological in conjunction with Felt Soul Media, has penned protest songs and authored books about Glen Canyon, the dam and the Southwest over the years. Just now wrapping up her latest project, “Dandy Crossing,” she tells the story of the handful of people who once lived at Hite, a river crossing that was drowned by Lake Powell, and what happened to them after they were forced from their homes. Lee, who is in her 90s, also serves on the advisory board of the Glen Canyon Institute, an environmental group that advocates the draining of Lake Powell and the restoration of the Colorado River. She still performs and speaks for educational and non-profit organizations, as well. It was nearly 60 years ago when Lee first floated into the red-rock labyrinth of Glen Canyon, but her memory of that place hasn’t faded a bit. She recalls a desert Eden of soaring Wingate walls, ancient ruins, maidenhair fern, canyon wrens and little arches everywhere. Lee, then a petite starlet and luminous folk-singer, who entertained raft trips with songs, fell headlong for Glen Canyon. Over the next couple years, she rafted and floated the Colorado and San Juan rivers dozens of times, exploring and naming the mazelike system of side-canyons, swimming in the canyon’s pools, running the rapids and becoming one of the most enduring characters of Colorado River lore. She and her friends mostly ignored early rumblings that a dam was coming, she said, because it seemed too implausible, too stupid to happen. And despite their fervent, forceful protests later on, construction commenced in 1956. The 710-foot-high concrete arch dam was completed in 1963, 15 miles upstream of Lee’s Ferry. In what has become a well-told narrative, the dam, which was built to create hydroelectricity, store water and provide flow regulation, then inundated one of the most breathtaking canyon systems in the country, leaving Lee both deeply broken-hearted and spitting mad. In the six decades since, Lee has emerged as one of the most colorful, vocal and sharp-tongued advocates for preservation of wild places in the Southwest. She is outrageous, mischievous, feisty, graceful, fearless and determined. Not afraid to call a shithead a shithead, sing an incendiary protest song or ride her bicycle naked through town, she calls Lake Powell “Rez Foul,” and has openly insulted U.S. Bureau of Reclamation (USBR) officials. And she’s not shy about her dreams for the future of Glen Canyon Dam. “I would like the dam to blow up completely all in one fell swoop, clean out the grand canyon, get rid of all that crap that’s in there now and be a river again,” said Lee. The dam has drastically changed the Colorado River watershed by decreasing sediment loads, threatening native fish, taming a wild river and drowning a world of grottoes, spires, canyons and cliffs under the second largest manmade reservoir in the United States. Lake Powell, which sits beneath breathtaking red-rock walls, has a storage capacity of 27 million acre-feet and stretches 186 miles when it is full. The Glen Canyon Institute, which was founded in 1996, has for years worked to restore Glen Canyon. Its scientific studies of the dam’s impacts helped win a lawsuit forcing the Bureau of Reclamation to re-evaluate how dam operations affect endangered species. But right now, there are no plans to decommission the dam and drain the reservoir. And that’s good news to many people. The hugely popular recreation area draws roughly 3 million boaters, water-skiers, campers and fishermen to its shores each year, according to the USBR. To Lee, the dam is an ugly reminder of one of America’s biggest mistakes. And though it may not happen in her lifetime, she is confident that if people don’t get rid of it, Mother Nature will, with time. With recent large-scale dam-removal projects unfolding in places like the Northwest, Lee says the awareness is starting to grow about the harm that can be caused by dams. But her advice for people goes beyond dams: Protect what you love, or you may lose it. “You better get off your butts and get out and protect what you love, because if you don’t make a noise, people won’t know what’s there, and if you make too much noise you’ll ruin it too,” she said. “I was so lucky to see [Glen Canyon], just so fortunate. That’s a gift that I will never be able to repay. Hidden behind the fences of Stanford’s Jasper Ridge Biological Preserve, Searsville Dam creates a stagnant reservoir where algae and non-native species thrive while steelhead and other threatened species are trapped downstream. Matt Stoecker spent his childhood tromping around in the creeks of the San Franciquito watershed where he grew up, hunting for frogs, fishing and exploring. One day in the mid-90s, he found himself below the 65-foot-tall Searsville Dam on the Corte Madera Creek when he experienced a seminal moment: He saw a 30-inch steelhead jump out of the water and smash itself against the dam. He had never seen a fish that size in the creek, and he was struck at the power and futility he witnessed. Stoecker soon began volunteering with the San Francisquito Watershed Council, then started a steelhead task force and has been working to remove small dams and other fish barriers in the watershed ever since. The dam, which is owned by Stanford University, was recently pushed into the spotlight because of a major sedimentation problem in the reservoir, a large-scale study of the dam, a federal investigation into possible violations of the Endangered Species Act and a lawsuit against Stanford. While university officials argue that dismantling the dam could jeopardize the reservoir’s riparian ecosystems and threaten downstream communities, Stoecker and other environmentalists say it’s been blocking fish passage for too long and it’s time for the dam to come down. “It’s an antiquated, environmentally harmful reservoir that’s at the end of its useful life,” Stoecker said. Searsville Dam and Reservoir sit amid the oak stands and serpentine grasslands of the Jasper Ridge Biological Preserve, a 1,189-acre outdoor laboratory used by Stanford University for research and education. The reservoir, which was created by the damming of Corte Madera Creek in 1892, was acquired by Stanford in 1919. Today it serves to store non-potable water for landscape irrigation at the school. San Francisquito Creek contains one of the last wild steelhead runs in the South San Francisco Bay, but Searsville Dam directly blocks their annual migration upstream to approximately 20 miles of former spawning and rearing habitat. But over the years, the reservoir has filled with an estimated 1.5 million cubic yards of silts, gravels and woody debris that have cost it more than 90 percent of its original capacity. Some experts estimate that the reservoir could fill entirely within a decade. Along with loss of the reservoir, sedimentation behind the dam threatens surrounding communities with possible flooding. The sedimentation issue helped prompt Stanford to form a 12-person steering committee in 2011 to study its options. The study is examining such things as Stanford’s long-term water needs, fish passage, flood risks, the costs of dredging and the impact on university research programs. According to Stanford, expert consultants are studying a number of options, including dredging, allowing the reservoir to continue to fill and transition to a marsh, modifying the dam and removing the dam altogether. Complicating the issue is the role the reservoir plays in the preserve. The reservoir, Field said, is home to beautiful open water and wetland habitats used by a large number of nesting and migratory birds. It sustains habitats for diverse plants and animals, including bats, salamanders and fish. It has also served the university as a living classroom for many years. Stanford anticipates completing the initial set of studies and recommendations in 2014. Its president and provost will ultimately decide how to act on them. Stoecker, who is now a biologist, had been pushing for a deeper look at Searsville Dam long before the school initiated its study. In 1999 he helped start a steelhead task force for the San Francisquito Watershed Council, which identified Searsville as the biggest barrier to migrating steelhead in the watershed, a primary source of non-native species and a principle contributor to the degradation of habitat. In 2001, along with Stanford and others, he helped form the Searsville Dam Working Group. It got the California Department of Water Resources to offer to fund an analysis of options for the dam — an offer Stanford declined. “Since then, every time we tried to bring up finding a Searsville solution that worked for everyone, folks from Stanford didn’t want to talk about it,” Stoecker said. In 2008, Stoecker formed Beyond Searsville Dam in partnership with American Rivers to push for a serious consideration of dam removal. Searsville Dam was built by the Spring Valley Water Company to supply drinking water to residents of the San Francisco Peninsula, but it never did. Instead, Stoecker said, for more than a century it has impeded fish passage to historic habitat, dewatered downstream creeks and blocked the transport of gravels, woody debris and sediment that is vital to a healthy river system and the San Francisco Bay. The reservoir flooded and buried a valley where several streams once merged among wetlands and riparian forests, and has created an artificial habitat for non-native and invasive species. Native rainbow trout (descendants of sea-run steelhead) persist in creeks upstream of Searsville, but are at risk of being wiped out due to inbreeding caused by the impassable dam and lack of returning steelhead to maintain genetic diversity. “Each year as it fills in more and more, it becomes less useful, more problematic and more expensive to fix,” Stoecker said, adding that Searsville provides a small amount of water to the university, which has plenty of options for water storage that do not imperil wildlife. Steve Rothert, California director of American Rivers, who also grew up upstream of the dam, said Stanford has “time and again missed opportunities to take initiative and take a leadership role in this. “I think Stanford has a phenomenal opportunity to create another broad set of studies that would be associated with the changes that would take place with removal of the dam and recovery of the natural ecosystem,” he said. Rothert said he is encouraged by Stanford’s current study, and thinks the committee consists of capable and committed people. But, he said, the fate of the reservoir is ultimately up to university officials, not steering committee members, and the university has appeared reluctant to open up the process. Following that news, two environmental groups — Our Children’s Earth Foundation and the Ecological Rights Foundation — filed a suit against the university alleging it is violating the ESA for harming steelhead trout. Stanford officials have expressed confidence that the school has not violated the act. “The university believes that it is in full compliance with the Endangered Species Act and all local, state and federal laws in its operations of Searsville Dam and Reservoir,” states a FAQ put together by Stanford. But Stoecker and Rothert, along with their legal team, disagree. Katie Klingsporn is a writer and editor of the Telluride Daily Planet in southwestern Colorado. Look for more of her posts highlighting issues featured in DamNation a documentary film being produced by Patagonia and Stoecker Productions in conjunction with the Colorado-based filmmaking team Felt Soul Media. Executive Producer of DamNation and Patagonia founder, Yvon Chouinard, has long been an advocate of dam busting and protecting free flowing rivers. Photo by Tim Davis. Despite their imposing numbers and size, most people never give dams a second thought. Patagonia founder and owner Yvon Chouinard is not one of those people. When he sees dams, he sees broken waterways, an antiquated way of thinking and a means of generating energy that is far from green. He also sees the potential to mend the damage by taking down dams. Chouinard [...] and biologist Matt Stoecker, are at the forefront of a growing movement to decommission dams in America. The best way to do that, they figure, is by raising public awareness and support. And they believe the public will only support dam removal if they understand the complexities. That’s the idea behind DamNation, a feature documentary produced by Patagonia and Stoecker Ecological in conjunction with the Colorado-based filmmaking team Felt Soul Media. The film, which will be released in spring 2013, explores successful dam-removals, looks at dams that are subject of current removal fights and shines a light on others eyed for future dismantling. It paints the history of dam building in America, and chronicles the evolution of dam-busters from the radical monkey-wrenchers of yore to the tie-wearing coalition-builders of today. It focuses on some of the pivotal figures on either side of the dam issue. Shooting began last summer, with filmmakers Ben Knight, Travis Rummel and Stoecker gathering footage from Maine to California. Though Chouinard and Stoecker aren’t shy about their position on taking down dams,DamNation seeks to explore the issue fairly. The filmmakers interview the farmers who rely on dams to irrigate their fields, Native people whose cultures’ depend on the salmon that dams have destroyed, and legislators who view dam opponents as environmental extremists. They speak with scientists, dam employees and others. Despite their usefulness, dams have hugely impacted the rivers they were built in, and many have outlasted their purpose. Chouinard has been working for two decades to take out dams, and he has discovered a pattern. Efforts typically begin with a small grassroots group that faces a steep uphill battle. Opponents are powerful, red tape is plentiful and many who are involved are resistant to change. If the group does manage to make it through the bureaucratic and permitting thickets and gain funding, support and success, it’s only through years of really hard work. The impetus for DamNation came from the desire to mainstream dam removal by showing the many benefits that result. Stoecker, who worked to successfully remove his first dam 10 years ago, noted that while dam-busting used to be a fringe idea, it’s now one routinely considered by governments and dam owners, as well as environmentalists. A good example of this new mindset, he said, can be found on the Elwha River in Washington, where a coalition of Native tribes, environmental groups and government officials worked together to take out the biggest dams in U.S history — the Elwha and Glines Canyon dams in and near Olympic National Park (a project featured in the film). “There are wild steelhead and salmon returning to the river above the Elwha Dam site before the project’s even done,” Stoecker said. Chouinard hopes DamNation will open people’s eyes. Katie Klingsporn is a writer and editor of the Telluride Daily Planet in southwestern Colorado. Look for more of her posts highlighting both the development of “DamNation” and the issues surrounding the complex topic of dam removal in America. We’ve heard of a non-profit raising money to save something, but have you ever heard of buying something to destroy it? Well, that’s the idea Laura Rose Day [left], executive director of the Penobscot River Restoration Trust put into action. In December 2010, a group of organizations working together as the Penobscot River Restoration Trust officially took possession of the Veazie, Great Works and Howland dams from Pennsylvania Power and Light in a historic deal worth $24 million. From Kevin Miller at the Bangor Daily News: Under an agreement brokered in 2004, PPL agreed to sell the three dams to the trust for roughly $25 million. PPL, in return, gained authorization to increase power generation at six other dams along the river, entirely offsetting the generation losses incurred when the Veazie, Howland and Great Works dams are decommissioned. “This landmark partnership has proven that business, government and interested citizens can reach mutually agreeable solutions that benefit the community, the economy and the environment,” Dennis Murphy, a vice president and chief operating officer at PPL, said in a statement Monday. Once complete, the project will have reopened nearly 1,000 miles of river and streams within the Penobscot watershed to endangered Atlantic salmon, sturgeon, American shad, alewives and seven other species of migratory, sea-run fish. In turn, those species help support other commercially important species, such as cod and lobster. Demolition of the Great Works Dam [pictured above with Laura Rose Day] is slated to begin in the summer of 2012. There’s a damn good chance it’ll be the biggest party Bangor Maine has ever thrown. Outside Magazine’s Adventure Ethics blog featured a Q&A with our producers Matt Stoecker and Travis Rummel. Huge thanks to Mary Catherine O’Conner for the thoughtful questions. Ok, two things: the above photo of Washington’s lower Elwha Dam was taken about six months ago. It is now GONE. Secondly, I had to look up the word “synopsis” which is probably a bad sign when you’re writing a synopsis. Oh well, don’t judge. Ninety-nine years after Olympic National Park’s Elwha River was illegally dammed, wild Chinook salmon still instinctively gather at the foot of the lower dam as if they sense a change in the current. Upstream, the usual low rumble of antique turbines generating electricity has faded, and the piercing sound of an excavator-mounted jackhammer reverberates off the 210-foot tall Glines Canyon Dam. De-construction crews have begun the painstaking process of chipping away at its mossy, con-caved facade. This moment marks the beginning of the largest dam removal in US history, unveiling the best opportunity for wild salmon recovery in the country. Dam removal is no longer the work of a fictional Monkey Wrench Gang. It’s real, upon us, a cornerstone of the modern environmental and cultural movements. The benefits from dams, including hydropower, urban water supply, irrigation, and flood protection have played a critical role in the development of the United States—but river ecosystems and Native American heritage suffered greatly. Now, many of these antiquated relics of the industrial revolution are classified as public safety hazards by the Army Corps of Engineers. The short-sighted development of a bygone era is growing more prevalent—In many cases, the high cost of retrofitting an aging dam, and meeting current environmental standards has led to a surprising shift in thinking: Dam owners, impacted communities, and politicians are now reevaluating the usefulness of certain dams and often advocating for decommissioning and removal. Some call it a movement, others call it a generational shift in values. Regardless of what it’s dubbed, an undeniable momentum behind river restoration has begun. DamNation is a collection of empassioned voices and spirited stories from the people entrenched on both sides of this devisive issue. Examining the history and controversy behind current and proposed dam removal projects, DamNation presents a dynamic perspective on Man’s attempt to harness and control the power of water at the expense of nature. Nothing lasts forever, not even the concrete monoliths that have impounded America’s free flowing rivers in the name of “progress” for ages. A huge scissors and a dotted line appear on a dam near Ojai. The message: Tear it down. If life imitated art, it would be a simple matter to follow the dotted line and snip a 200-foot dam near Ojai off the face of the earth. For years, an alliance of environmentalists, fishermen, surfers and officials from every level of government has called for demolishing the obsolete structure. Now, an anonymous band of artists has weighed in, apparently rappelling down the dam’s face to paint a huge pair of scissors and a long dotted line. The carefully planned work popped up last week and is, no doubt, Ventura County’s most environmentally correct graffiti by a dam site. “Everyone I’ve talked to has really enjoyed it,” said Jeff Pratt, Ventura County’s public works director. “It sends a good message.” That message? Tear the thing down already. Matilija Dam was built in 1947 for flood control and water storage. But officials say it was flawed from the outset. For decades, it’s been holding back silt as much as water, depriving beaches 17 miles downstream of the sand they need to replenish themselves.It’s also been deemed a huge obstacle for steelhead trout, an endangered species that was once a trophy fish luring anglers from across the country. Officials say they don’t know who painted the shears, and they’re careful to note that such acts — even in the name of art — are illegal and dangerous. The dam is challenging enough that rescue squads use it for climbing practice, pounding in metal anchors that may have aided the scissors hands. But even if the painting is no more legal than garden-variety graffiti, some say it speaks to the takedown’s glacial pace.